This is my second book, and it is different from ‘The Old Town Bookshop’. Now we have built even 8 different stores, similar in construction, but different in decoration, each in its own style. That is why it is “Variations on Vintage”! The book decribes the building of the stores, as well as the decoration and furnishing. The 8 stores are covered extensively, in 8 photography chapters. That makes it a lovely book, also just to look pictures and get inspired by them. A lot of attention is paid to different techniques of painting, and the effect of coloring. And in decorating in general, with tile work. 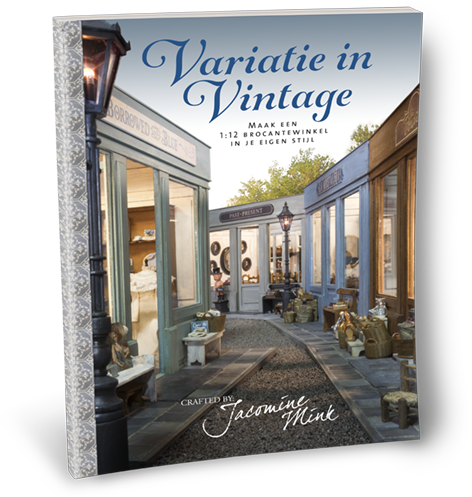 When you have read this book, you are full of inspiration and know how to build your favourite Vintage store. The book is in Dutch language, but has by now found readers in 16 countries on 4 continents. It is in a large, nice size of 28 x 21.5 cm, in full color, and has 132 pages. The price is €24.95 excl. postage costs and you can order it here.